Jacquelyn "Jaci" Davette Velasquez (Spanish Jaci Velásquez, born October 15, 1979) is an American actress and Contemporary Christian and Latin pop singer and songwriter, performing in both English and Spanish. Contemporary Christian music is a genre of modern popular music which is lyrically focused on matters concerned with the Christian faith. It formed as those affected by the 1960s Jesus movement revival began to express themselves in a more contemporary style of music than the hymns, Gospel and Southern gospel music that was prevalent in the church at the time. Today, the term is typically used to refer to pop, rock, or praise & worship styles. Latin pop refers to pop music that contains sounds or influence from Latin America, but it can also mean pop music from anywhere in the Spanish-speaking world. Latin pop usually combines upbeat Latin music with American pop music. Latin pop is commonly associated with Spanish-language pop, rock, and dance music. Since late 2010, Velasquez has co-hosted a morning radio show with Doug Griffin. Velasquez was born in Houston, Texas. She is of Mexican, Spanish, French, Scottish, and Arab ancestry. She grew up in an evangelical church where her parents were singers and pastors. Although she has described herself as a "Non-denominational Christian", she stated in an interview with Morris Cerullo that "you're talking to an Assemblies of God's girl"[ citation needed ]. Houston is the most populous city in the U.S. state of Texas and the fourth most populous city in the United States, with a census-estimated population of 2.312 million in 2017. It is the most populous city in the Southern United States and on the Gulf Coast of the United States. Located in Southeast Texas near Galveston Bay and the Gulf of Mexico, it is the seat of Harris County and the principal city of the Greater Houston metropolitan area, which is the fifth most populous metropolitan statistical area (MSA) in the United States and the second most populous in Texas after the Dallas-Fort Worth MSA. With a total area of 627 square miles (1,620 km2), Houston is the eighth most expansive city in the United States. It is the largest city in the United States by total area, whose government is similarly not consolidated with that of a county or borough. Though primarily in Harris County, small portions of the city extend into Fort Bend and Montgomery counties. A non-denominational person or organization is not restricted to any particular or specific religious denomination. Morris Cerullo is an American pentecostal evangelist. He has traveled extensively around the world for his ministry. He hosts Victory Today, a daily television program, and has published more than 80 books. Myrrh Records, also known as Myrrh Worship, was an American Christian music record label. According to Encyclopedia of American Gospel Music, the label was instrumental in developing a popular following for contemporary Christian music as the label that first published music by Barry McGuire, 2nd Chapter of Acts, Randy Matthews and Nancy Honeytree. The label is also known for serving as the first label for popular Christian crossover singer Amy Grant, who joined the label in 1977. She stayed with Myrrh until 1999. Heavenly Place is Jaci Velasquez' debut major label album, released in 1996 on Myrrh Records. 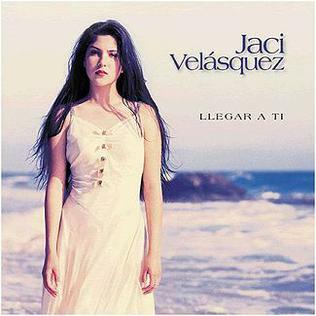 Llegar a Ti is the first Spanish release by contemporary Christian music singer Jaci Velásquez. The album peaked at No. 4 on the Top Latin Albums chart while the title track reached No. 1 on both the Billboard Hot Latin Tracks and Latin Pop Songs charts. It received a nomination for a Grammy Award for Best Latin Pop Album, and the album's lead single, "Llegar a Ti", was nominated at the first Latin Grammy Awards in the category of "Best Latin Pop Female Performance". Mi Corazón is the second Spanish album recorded by American Latin pop and contemporary Christian singer Jaci Velasquez. It was released by Sony Music Latin on May 8, 2001. The album charted in the top 10 on both the Latin Pop Albums and Top Latin Albums charts. lead single, "Cómo Se Cura Una Herida", charted at No. 1 on the Billboard Hot Latin Tracks chart. The album received a nomination for a Grammy Award for Best Latin Pop Album in the 44th Annual Grammy Awards on February 27, 2002, and it won a Dove Award for Best Spanish language album of the year. In 1998, she signed to Sony Discos for a four-album deal and was introduced to Rudy Pérez, who produced her first Spanish-language crossover album Llegar a Ti which topped the Billboard Hot Latin Tracks chart, the first Christian track to top that chart of its kind. This album enabled Velasquez to achieve crossover success by building a fan base among Hispanics. Her first single, "Llegar a Ti," topped the Billboard Hot Latin Tracks and became the first Christian song to top that chart. The song also gave her a Latin Grammy Award nomination for Best Pop Female Vocal Performance. Rudy Amado Pérez is a Cuban-born American musician, songwriter, composer, producer, arranger, sound engineer, musical director and singer, as well as entertainment entrepreneur, and philanthropist. His area of specialty is ballads, although he has also worked in a variety of other genres. A Latin Grammy Award is an award by The Latin Recording Academy to recognize outstanding achievement in the Latin music industry. The Latin Grammy honors works produced anywhere around the world that were recorded in either Spanish or Portuguese and is awarded in the United States. Submissions of products recorded in regional languages from Latin America and the Iberian Peninsula of Hispanophone or Lusophone countries such as Catalan, Guarani, Quechua may also be considered. Both the regular Grammy Award and the Latin Grammy Award have similar nominating and voting processes, in which the selections are decided by peers within the Latin music industry. Her Latin music success includes five Spanish-language releases, two No. 1 Latin Billboard Singles, two Platinum albums, a Premio Lo Nuestro Award for New Artist of the Year, two Billboard Latin Music Awards, and four Dove Awards for Spanish Language Album of the Year. 2004 Best Female Pop Vocal Album Milagro. 2017 Best Christian Album Confío. 1998 Song of the Year, "On My Knees"
2000 Special Event Album of the Year, "Streams"
2000 Spanish-language Album of the Year, "Llegar a Ti"
2002 Spanish-Language Album of the Year "Mi Corazon"
2003 Spanish-Language Album of the Year "Navidad"
2017 Spanish-Language Album of the Year "Confio"
2018 Best Female Vocal Album of the Year "Confio"
Mi Reflejo is the second studio album and first Spanish-language album by American singer Christina Aguilera. It was released on September 12, 2000 by BMG U.S. Latin. After the commercial success of her debut studio effort, Christina Aguilera (1999), Aguilera recorded her follow-up project during 2000. It includes five Spanish-language versions of tracks from her previous album, in addition to four original compositions and two cover songs. The tracks were adapted and composed by Rudy Pérez who also produced the album. Live! or Selena Live! is a live album by American Tejano pop singer Selena, which was released on May 4, 1993 by EMI Latin. The album was re-released on September 22, 2002 as being part of the Selena: 20 Years of Music collection; which included spoken liner notes by her family, friends and her former band members Selena y Los Dinos. Live! includes three cumbia-influenced studio tracks, while the rest of the album consists of live versions of previously released songs. The album was recorded during a free concert at the Memorial Coliseum in Corpus Christi, Texas, on February 7, 1993. It was certified gold by the Recording Industry Association of America in its first year, double platinum in 1995, and gold (standard) in 2002. Anaís Martínez is a Dominican singer. She was the winner of the second season of Objetivo Fama, a Puerto Rican reality-show-contest that airs on Univision Puerto Rico in Puerto Rico and on the Telefutura network in the mainland. Mi Tierra is the third studio album by Cuban-American recording artist Gloria Estefan, released on June 22, 1993 by Epic Records. Produced by husband Emilio Estefan, it is her first Spanish-language album and pays homage to her Cuban roots. The album features Cuban musical genres, including boleros, danzan and son music. Recorded at Crescent Moon Studios in Miami, Florida, Mi Tierra features notable Latin musicians such as Tito Puente, Arturo Sandoval, Cachao López, Chamin Correa and Paquito D'Rivera. Tomas Torres Carrasquillo, known professionally as Tommy Torres, is a Puerto Rican songwriter, producer and singer. Named "#1 Hot Latin Tracks Producer" of 2007 by Billboard magazine and Composer of the Year at 2010 ASCAP's Latin Music Awards, Torres has written and produced songs for many artists including Ricardo Arjona, Jaci Velásquez, Ednita Nazario, Alejandro Sanz, Ricky Martin and Franco De Vita. David Mullen is a former Blues Pop / CCM singer, songwriter and musician. Later he became well known as a songwriter, music producer, and film score composer. He released his first album in 1989, and won the GMA Dove Award for New Artist of the Year in 1990. He later recorded his last album in 1994. Since then, he has written and produced recordings for several other Christian artists, most notably Nicole C. Mullen. La Llave de Mi Corazón is a studio album recorded by Dominican singer-songwriter Juan Luis Guerra, It was released by EMI Televisa Music on March 20, 2007. It peaked at number 77 on the Billboard 200. A special edition of the album was released on October 2, 2007. In 2007, the album won six Latin Grammy Awards. The album won a Grammy Award for Best Traditional Tropical Latin Album at the 50th Annual Grammy Awards on February 10, 2008. Milagro (2003) is the third Latin album by Christian singer Jaci Velasquez. This record won a Billboard Latin Music Award in the category "Best Christian Album". Although lyrically considered the most secular of all her works, the album was not as successful as her previous Spanish works due to Sony Discos changing hands in management that same year and a lack of promotion. The album was nominated for "Best Female Pop Vocal Album" at the Latin Grammy Awards in 2004. Enrique Iglesias: 95/08 Éxitos is a compilation album by Spanish singer songwriter Enrique Iglesias. Includes his seventeen number-one singles in the Billboard Hot Latin Tracks and two new songs, "¿Dónde Están Corazón?" and "Lloro Por Ti", both written by Enrique Iglesias and Coti Sorokin. The album's two singles "¿Dónde Están Corazón?" and "Lloro Por Tí" became his 18th and 19th number one singles on the Hot Latin Songs, achieving more number ones than any other artist in the history of the chart. Huelo a soledad is the 17th studio album by Mexican pop singer, Ana Gabriel. It was released in 2001. This album was nominated for Female Pop album of the Year in the Billboard Latin Music Awards, but lost to Jaci Velasquez's Mi Corazón. Puerto Rican singer Ricky Martin has released seventy-nine Spanish and English-language singles. In 1984, thirteen-year-old Martin became a member of the Puerto Rican boy band Menudo. After recording eleven albums with the group, he left Menudo in 1989, hoping to rest and evaluate his career path. In 1990, he was signed to Sony Discos, the Sony Music's Latin imprint. Martin released his debut solo album, the Spanish-language Ricky Martin, in November 1991. It included hit singles: "Fuego Contra Fuego", "El Amor de Mi Vida" and "Vuelo". His second Spanish-language solo album, Me Amarás (1993) featured further successful singles: "Me Amarás", "Que Dia Es Hoy" and "Entre el Amor y los Halagos". "Como Vai Você" is a song written by Brazilian singer Roberto Carlos from his album Roberto Carlos (1972). Julissa Arce Rivera commonly known simply as Julissa, is a Puerto Rican Christian music singer. "O Tú o Ninguna" is a song written by Juan Carlos Calderón and produced and performed by Mexican singer Luis Miguel. The song is a bolero in which the protagonist cannot envision his life without anyone else besides his love interest. It was released as the second single from the album Amarte Es un Placer on 6 September 1999. The track reached the top of the Billboard Hot Latin Songs chart in the United States and peaked at number seven on the Brazilian Singles Chart. "Detrás de Mi Ventana" is a Latin pop song by Mexican recording artist Yuri from her studio album Nueva Era (1993). The track was written by Guatemalan singer-songwriter Ricardo Arjona. It was released as the lead single in Latin America and the United States, peaking atop the Billboard's Latin Songs chart, becoming the third number-one song in the chart for the singer and the first for Arjona as a songwriter. Trust/Confío is a studio album by Jaci Velasquez, released on March 31, 2017 as a two-disc collection where one disc contains her eighth English-language album,Trust, while the other disc contains her fourth Spanish-language album, Confío. At the 48th GMA Dove Awards, Confío won Spanish Language Album of the Year. The album reached No. 7 on the Billboard Latin Pop chart and was nominated for the 2017 Latin Grammys for Christian Album of the Year. The 7th annual Billboard Latin Music Awards which honor the most popular albums, songs, and performers in Latin music took place in Miami. ↑ "Ask Billboard". Billboard. April 11, 2008. Retrieved December 30, 2011. 1 2 3 4 "Jaci Velasquez Announced As New Co-host of The Family Friendly Morning Show with Doug Griffin". Today's Christian Music/CCM Magazine. Archived from the original on March 30, 2012. Retrieved October 14, 2011. 1 2 "Jaci Velasquez - Biography". Archived from the original on December 20, 2014. ↑ "Jaci Velasquez: Chasing Papi star with a blazing trail of album hits – Main Cover – Cover Story". Findarticles.com. Archived from the original on April 3, 2013. Retrieved February 14, 2012. ↑ "Jaci Velasquez Bio". Net Industries. Retrieved September 22, 2011. ↑ "Jaci Velasquez No. 1 on Both English, Latin Charts - Christian Activities". www.christianactivities.com. Retrieved June 6, 2018. ↑ "Photo Gallery". America.gov. June 30, 2008. Retrieved September 16, 2011. ↑ "Jaci Velasquez signs to Inpop Records". Christian Today. August 22, 2011. Retrieved September 16, 2011. ↑ "Jaci Velasquez - Buenas Noches mi Sol" . Retrieved March 28, 2017. ↑ "Jaci Velasquez To Release First New Album in Five Years". The Christian Beat. January 23, 2017. Retrieved March 28, 2017. ↑ "Jaci Velasquez releases the album Trust". GospelPrime. March 31, 2017. Retrieved March 31, 2017. ↑ "2017 Winners - The 48th Annual GMA Dove Awards". doveawards.com. ↑ "About Jaci Velasquez". Today's Christian Music/CCM Magazine. ↑ Faith, Reel (2017-09-29). "Jaci Velasquez on 'A Question of Faith,' Christian Entertainment". Reel Faith. Retrieved 2019-01-27. ↑ "Jaci Velasquez Divorced". Christianitytoday.com. August 16, 2003. Retrieved September 16, 2011. ↑ "Austin Wedding for Jaci Velasquez, Nic Gonzalez". Lovetripper.com. December 17, 2006. Retrieved September 16, 2011. ↑ "Jaci Velásquez and Nic Gonzáles Welcome Son Soren Arthur – Moms & Babies – Moms & Babies - People.com". Celebritybabies.people.com. March 2, 2009. Retrieved December 4, 2012. ↑ "THE VELASQUEZ JOB Episode DRVD-1309H". DIYNetwork.com. Archived from the original on December 4, 2014. Retrieved January 29, 2015. 1 2 3 4 5 6 "Album chart history". Rovi Corporation / Billboard . Retrieved December 30, 2011. 1 2 3 4 5 "American certifications – "Velasquez, Jaci"". Recording Industry Association of America . Retrieved December 30, 2011. ↑ "Charts". Billboard. Retrieved 2018-05-31. ↑ "Jaci Velasquez Chart History". Billboard. Retrieved 2018-05-31. 1 2 3 4 5 6 7 "Velasquez's Hot Latin Tracks chart history". Rovi Corporation / Billboard. Retrieved December 30, 2011. ↑ "Velasquez's Hot Dance Music chart history". Rovi Corporation / Billboard. Retrieved December 30, 2011. ↑ "Past Winners - The 49th Annual GMA Dove Awards". doveawards.com. Retrieved June 6, 2018.